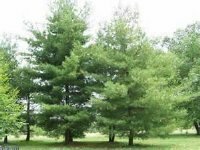 PINE< EASTERN WHITE – Zone 3-7, Prefers full sun or partial shade. 50-80' in height, 20-40' spread. Pyramidal shape. Prefers well-drained, sandy, loam soil. Grows about a foot a year."